Today, 11/11 at the 11th hour, our Community honored all who have served our country. It was an emotional day filled with memories and beauty. The Veterans Day Celebration was a special event to be shared with all. ﻿Early in the day down at the riverfront on the Green River, Veterans, family members and friends gathered to prepare for a balloon launch later in the day, in memory of those we have lost. ﻿At 11:00 sharp, George Rhodes welcomed all in attendance at the City Building, formally the Armory. The presentation of colors was provided by the MCHS JROTC. Sierra O'Nan, member of the MCHS JROTC sang the National Anthem. There was a recognition of Veterans in Attendance with Daven Edmonds playing the Service Hymns of each of the US Military groups. ﻿The MCHS JROTC presented a beautiful tribute to all POW/MIAs after which all deceased veterans passing this past year were named and honored. The Guest Speaker was Phillip Morris, Colonel U.S. Army, Retired, who is no stranger to McLean County. He told many stories but also provided relevant and current information relative to all U.S. Military Groups. Wayne Morris sang "God Bless the U.S.A." and Ronnie Dame offered a blessing for all Veterans and for our dinner. 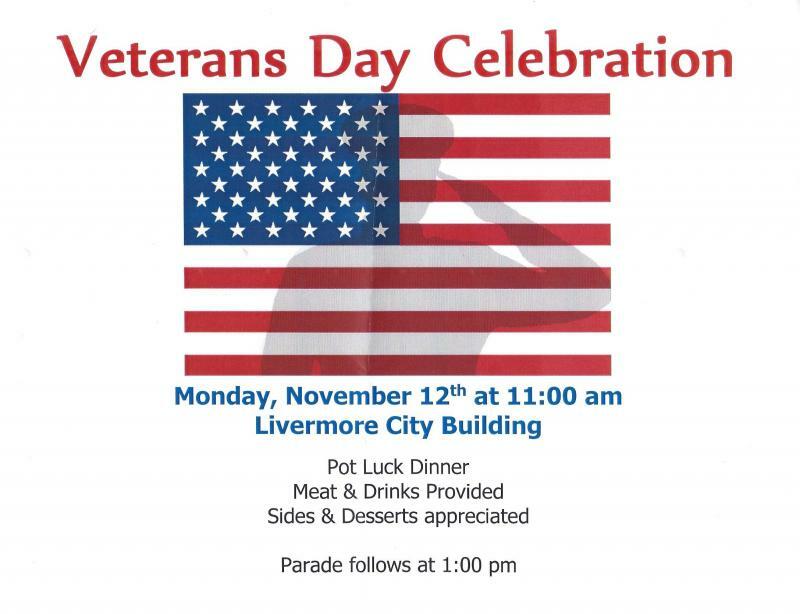 ﻿After a enjoying a fine meal, all proceeded down to the riverfront to welcome the parade elements including the MCHS JROTC, the MCHS Band, escorted by the Livermore Volunteer Fire Department. Thanks to B.F. Evans Ford for sponsoring the Commemorative Veterans Day 2016 mugs and many thanks to our additional sponsors: A&S Fabricating, City of Livermore, First State Bank, Hometown IGA, Independence Bank, Livermore Lions Club, Modern Supply, Muster Funeral Homes, Ohio Valley Energy, Inc., Shelter Insurance, Fairway Realty, Specialty Foods Group Inc., and to VFW Post #5415.
and honor and celebrate our Veterans. Our City of Livermore had the honor to participate again in this annual event today﻿. Many have looked at this table and wondered...Let me explain. ﻿﻿This table is set for five, representing the frailty of prisoners against their oppressors. Remember, the table is round to show our everlasting concern for our missing men. Remember, the table cloth is white to represent the purity of our soldier's intentions to respond to their country's call to arms. ﻿﻿﻿﻿﻿﻿Remember, the candle is placed in the center of the table to represent the families of loved ones, who kept the faith, waiting the return of ones so dear to them. Remember, the red ribbon tied so prominently around the candle is reminiscent of the red ribbon worn upon the lapel and breast of thousands who bear witness to their unyielding determination to demand a proper accounting of our missing. ﻿﻿﻿﻿Remember, a pinch of salt on the bread plate is symbolic of family’s tears as they still wait. ﻿Remember, for all of you who have served with them, called them your brothers and sisters, depended upon their might and aid, and relied on them, remember them, for surely they have not forgotten you." The Livermore Veterans have been reworking the walkways surrounding the tank at the Riverfront Memorial. The gravel was removed and a hard surfaced-exposed aggregate concrete surround has replaced the gravel. Larry Howard applying the finish with A great day for concrete to set! 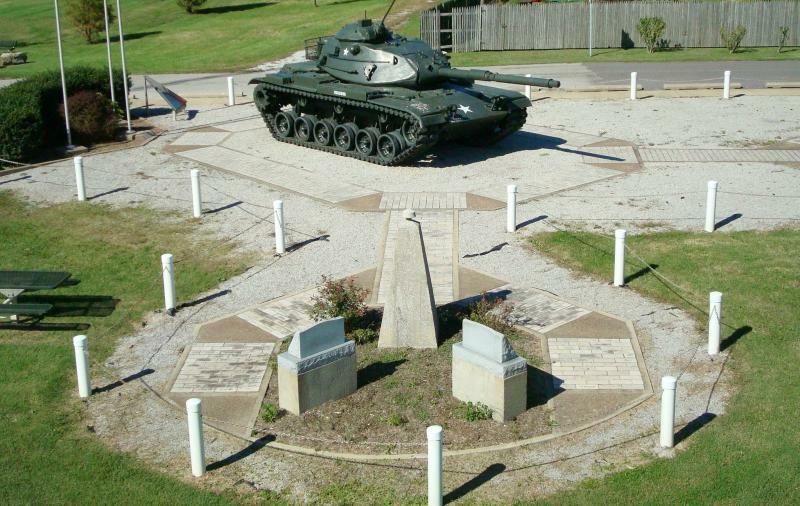 The City of Livermore held the "Dedication of the Memorial Walkway and Army Tank" on Saturday, June 29, 1996 at the Livermore Riverfront Park. This project began as a dream to preserve the history of and love for the Livermore unit of Kentucky National Guard and the desire to honor the service these men gave their community, State and America. A committee was formed and the dream grew to include other men and women who served in other branches of the Armed Services. 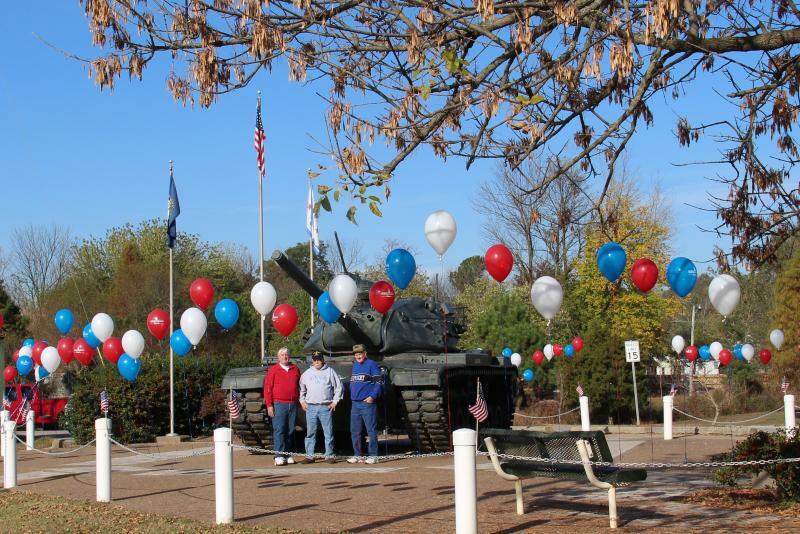 The request for the acquisition of the tank was made in January, 1995 to Warren, Michigan - the M60A3 Army tank was delivered to this site December 12, 1995 by the KYARNG Transportation unit from Bowling Green. 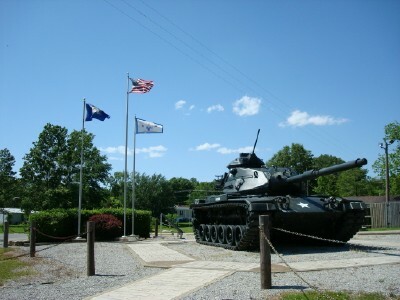 The tank was brought from the Western KY Training Site in Greenville, KY. 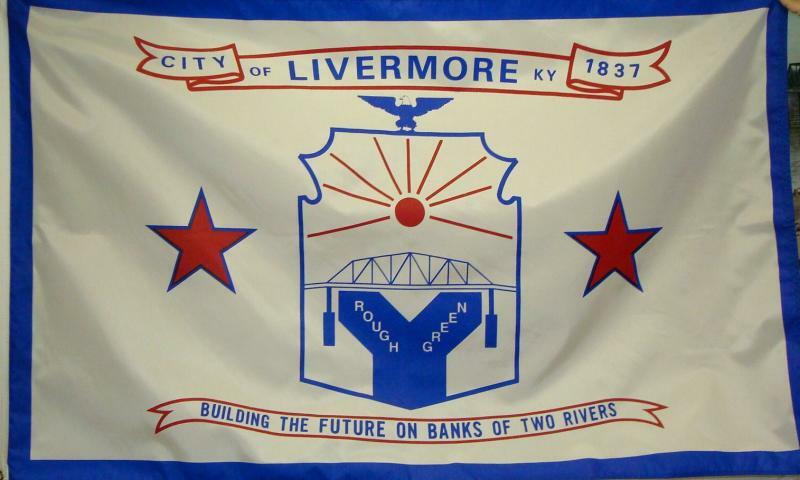 When the National Guard committee decided to do the Walkway and Tank Display, it was suggested we have 3 flags showing the U.S., Kentucky & Livermore flags. The problem was that Livermore had no city flag. The idea was presented to the City Council to have a contest for a design and on March 14, 1996 the Livermore City Council chose the design by Ret. PSG Richard Dale Johnson as the one to represent our town. The flag shows the city was founded in 1837 on the banks of the Green and Rough Rivers and the one-of-a-kind bridge that crosses these two rivers, beginning in one county (McLean County), crossing another county (Ohio County) and ending in the same county it began in (McLean County). The sun is for the bright future of our town, the eagle represents our nation's freedoms and the stars represent the two rivers, as well as the two counties the bridge crosses. The flag was displayed to the public and raised for the first time on June 29, 1996. The Memorial Walkway is comprised of 500 engraved bricks. Each name that was placed in this walkway is here because of love and pride - the love and pride of each individual or a family member or friend that this person served his or her country when needed. This is an ongoing project. If you wish to honor someone or their memory, who is not yet a part of this walkway, you may contact the City Office at 278-2113 or simply download the Veterans Memorial Walkway Engraved Brick order form below. Because new bricks are placed on the walkway when sufficient new bricks are received to complete a section on the walkway, we ask you to contact John "Sonny" Renfrow, Chairman at 270-499-2922 or George Rhodes, Treasurer at 270-278-2759 to order a personalized brick. The Tank Committee - Eldon Eaton, Pet Wright, Richard Dale Johnson, Ellis Allen Price, George Rhodes, Robert Earl Humphrey, Mason Humphrey, Bobby Duvall, Curtis Humphrey and Linda L. Johnson. Livermore City Council Members - Glenn Ford, Raymond Gray, Hilton Shocklee, Shirley Sartain, Mason Humphrey and Jerry Zuehl. And to numerous other Citizens representing the City of Livermore, thank you.